London (AFP) - London's nightclubs, where sweaty revellers move and shake to thumping beats, are legendary. But now a quieter, more polite clubbing experience is gaining fans -- the silent disco. At silent discos, partygoers don headphones and dance noiselessly to the music they are listening to. Thanks to the headphones, there is no thudding bassline to shout over -- those who are not dancing can talk, laugh and clink glasses as if they were in their own home. 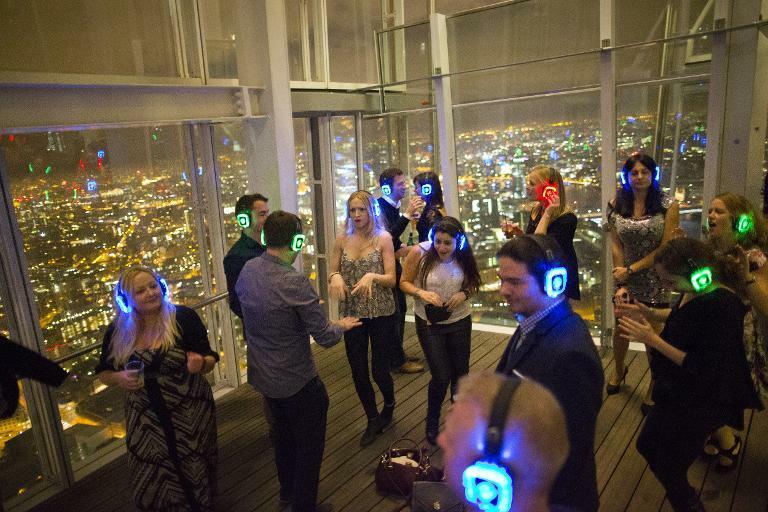 One recent Saturday, London's Shard -- the iconic glass and steel spike which at some 310 metres (1,000 feet) is the European Union's tallest building -- hosted a silent disco. "We can have three separate gigs, so no one in the building will have the same experience because they're always changing to different music." Near the turntables, four young women wearing miniskirts and stylish makeup danced to RnB anthem "No Scrubs" by TLC on the green channel. Nearby, a thirtysomething in a flowery shirt was getting funky to "That's the Way (I Like It)" by KC and The Sunshine Band, playing on the blue channel. "I think it's brilliant. You need to come with a group of people, it's better that way," said 53-year-old Geraldine Copley-Smith, one of the revellers. "It's not that I'm bored -- I like going to normal nightclubs -- but it's a novel thing to do." The silent disco concept dates back to 2002, led by Dutch producer, DJ and performer Nico Okkerse. He says he was the first person to run an event and call it a silent disco and now runs www.silentdisco.com. However, he was not allowed to trademark the name and said the global popularity of the concept "did not make me rich". Okkerse saw a growing appetite for the concept, predicting that new technology would fuel growth. "On the horizon, I see strong wifi capacity and new-generation smartphones which will make it possible to offer exclusive events without the need to bring tons of equipment," he said. 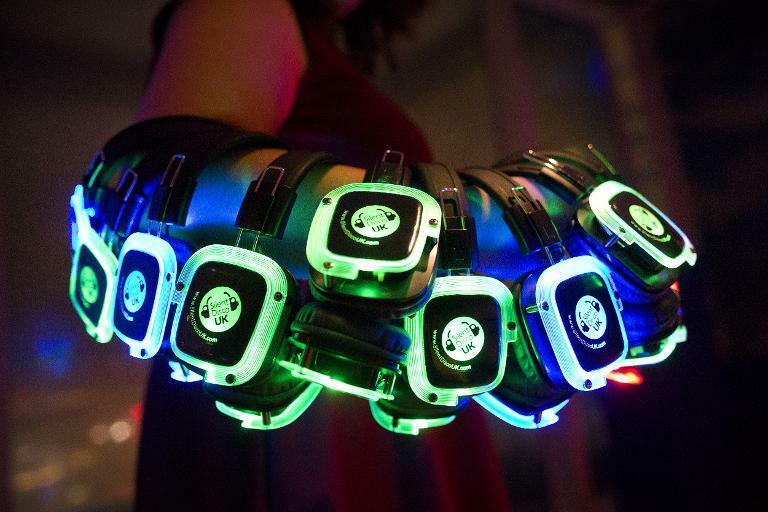 While silent discos are now relatively common, David Zangwill, an American, wants to take the concept to the streets where, he said, "the psychic armour that so many of us are wearing covers up and prevents our true colours from shining through." He has launched "Silent Disco Squad" -- parties organised in parks and public transport with headphones providing the music. "We meet up, we count down, we press 'play' and then respectfully spread joy and mayhem around our city," Zangwill said. "And we end with a group hug." 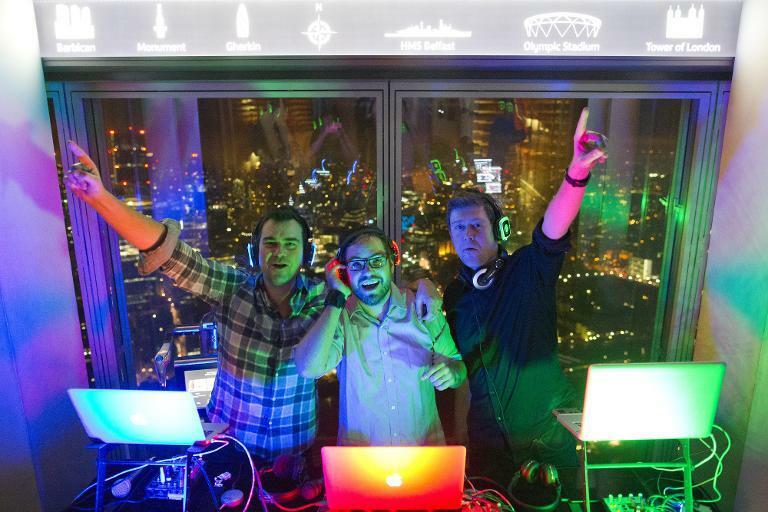 At the top of The Shard, the silent disco was reaching its climax, with Rochford dropping the needle on "Afterglow" by London producer Wilkinson. There may not be the euphoric roar of the conventional nightclub but despite the relative quiet, the partygoers have had a great night. "I look around me and all I can see is a number of shared experiences," said Stuart Taylor, a 35-year-old management consultant. "Everybody is so lost in their music, everybody lost their inhibitions."